Sam and POW comrades as railway navvies do the full John Henry, manhandling steel rails – feeling oddly consoled by proper work and respect from their guards. But then… to Germany, the Saar, and impromptu imprisonment in a corner shop! A hundred years ago this week… Another lull between major actions as the opposing sides gathered themselves for the next onslaught. No doubt, on the Western Front at least, all expected that to come from the Allies after their defensive success against four waves of German attacks from the Spring Offensive in March onwards. The Americans concluded their first long battle at Belleau Wood (June 1-26), successfully holding the line against the last vestiges of the German offensive, justifying their initial refusal to accept French urgings to conduct a tactical retreat. Meanwhile, the British raided at Vieux Berquin (26; west of Armentières) and northwest of Albert, Somme department, and repulsed an attack near Merris, Nord department (both 30), and the French captured Cutry Plateau, Aisne department (28), hills between Mosloy, Hauts-de-France department, and Passy-en-Valois, Aisne department (29). Air raids abounded with the British flying inside Germany to attack Saarbrucken, Offenburg and Karlsruhe (25), while the Germans bombed Paris on successive days (26-30). With the German Army biting into more and more territory from defeated Russia on the Eastern Front, the gathering White Russian opposition, abetted by the renegade Czechoslovak Legion who’d travelled the length of the Trans-Siberian Railway taking cities en route, declared an anti-Bolshevik provisional Government in Vladivostok on the Pacific coast (June 29) – 9,000 kilometres east of Moscow and 6,500 east of Omsk, where the White Russians had set up their first HQ. At the same time, the Allies fomented an alternative alternative by taking Murmansk in northwest Russia on the Barents Sea and persuading the regional Soviet to support them against the Bolsheviks (30). In Italy, the Second Battle Of The Piave June 15-24) concluded too. The Italian Army had recovered all territory lost to the Austrians, but their C-in-C General Diaz refused Allied advice to follow up and drive the Austrians northwards. He believed their resources would be stretched too thin. Even so, they pushed forward in a couple of areas with the capture of the bridgehead at Capo Sile north of Venice (June 25) and of Monte di Val Bello and Col De Rosso above the Asiago Plateau (30). Otherwise, the only notable action saw the Turks’ Persian Campaign continue when they beat off the Armenian siege of Khoy (June 24 onwards; in Western Azerbaijan, between the Black Sea and the Caspian). Last week, my father, Signaller Sam Sutcliffe, taken prisoner outside Arras and then part of randomly-assembled bands of POWs – wandering from Denain to Marchiennes to Sancourt to Bapaume – moved to a country encampment where he and his comrades were set to work building a railway. At least the food improved temporarily, although Sam still felt hunger pangs acutely enough to throw himself off a fast-moving truck in quest of a small mushroom – by pure luck saving himself from a bloody crash which occurred moments later. ‘The embankment and cutting completed, we moved on into the woods and, for a change, sampled tree-felling as an occupation. Most of us proved too physically impaired to swing an effective axe, but we could work steadily on a two-man crosscut saw. Our cheerful chief acknowledged this and procured more saws – whereas the average infantry or Landsturm officer would have driven us on with snarls and blows to swing axes until we dropped exhausted or injured ourselves. When a tree crashed down, we stripped off branches with hatchets and saws, trimmed the sturdier branches into useful lengths suitable for pit props etc, while the trunks would make telegraph poles or go to sawmills. When a path of the correct width had been cleared through the wood, we debouched on to a mainline railway and, having prepared the ground, track-laying commenced – the really heavy graft. We went back to where we’d started and began to lay a full-scale, single-line railway, replacing the light, narrow-gauge track we’d used when building up the embankment and cutting. Sleepers to be manhandled, laid, packed and secured – adding stone ballast to stabilise them – holes for bolts drilled, and finally the so-heavy lengths of steel rail to be carried and lowered into position. Experience taught us that the men carrying a rail must be placed in line with careful regard to height; a short man between two taller chaps would contribute nothing to the general effort – and effort it really was in our underfed condition. Despite that – how it happened I don’t know and I’m sure the slightly better food was only part of it – to me, the moral quality of that gang of fellow prisoners felt higher than that of most with whom I had recently lived. We responded to our engineer overseers – types superior to the Landsturm prison-camp guards – and especially to the sporty, cheerful officer in charge, by working to the best of our abilities and not scrounging; for the time being, our bearing returned to its former upright posture, the shrinking pariah stoop disappeared, and we began to feel like men again, instead of scruffy slaves behind barbed-wire fences. However, something appeared to go wrong with the railway plan before we had completed it, and our next outing took us and our few miserable possessions to a station on the same main line which our single-line track would have joined. More British prisoners, strangers to us, had already assembled there and we all piled into railway wagons when ordered to do so. I managed to squat near a door which the guard kept open so that he could sit with his legs dangling out. Aged about 35, I reckoned, he took a keen interest in the passing views and, from time to time, drew a mouth organ from a tunic pocket and played or sang a tune. His face reminded me of several brothers who had lived near us in pre-war days, the Knappers – all hard-working house decorators and general handymen. Had they also been Germans I wondered, along with the Schmidts and Schulzes and others who disappeared so suddenly as war began? (3) When the musician gave a lively rendering of Yip-I-Addy-I-Ay(4), a song we in Britain had been singing around 1914, I wondered the more. He took little notice of us and never seemed to understand English when spoken to, so I may have been mistaken about him. German ingenuity solved a transport problem, even in those far-off days. Goods on railway wagons often had to be offloaded from lorries then, at their destination, transferred once more to a road vehicle. The Germans had means whereby they could replace a lorry’s wheels with railway wheels so that the lorry could then drive along the railway line! This I saw often in areas contiguous to the battlefield. They must have planned it pre-war, noting that their lorries fitted the width of French railway tracks too. Around this time, we occasionally encountered the sad sight of a train of flat railway trucks each carrying a captured British tank – on their way to the Fatherland for scrap, I guessed. On the other hand, more encouragingly we passed through Cambrai(5) which, on its eastern side, was just at that moment starting to come under fire from British long-range artillery. We first alighted from this train at a town called Saargemund(6). The guards led us across a great mass of railway lines and it seemed fortunate that we were not run down by a train as we lumbered and stumbled over track after track. (3) ‘The German people so much a part of the community Sam grew up in around Edmonton, north London, all vanished around the time war was declared – they either fled or were interned, as described in the Memoir, Chapter 12. (4) Yip-I-Addy-I-Ay: recorded by Bob Roberts on Albany Indestructible Cylinder in 1909, written by Americans Will D. Cobb (lyrics; 1876-1930, also co-wrote In The Good Old Summer Time, Goodbye Dolly Gray) and John H. Flynn (composer), but with a German-American lead character it seems: “Young Herman Von Bellow/A musical fellow/Played on a big cello each night/… And music so mellow/He sawed on his cello/She waltzed up to him and she cried,/‘Yip di ada di ay, di ay’”. (5) Cambrai: a town I think he’d visited before, though he didn’t name it – it’s four miles south of the grim Sancourt POW camp where he spent several weeks in April-May, 1918 (Blogs 201 May 13 to 204 June 3) – but also 33 miles south-east of Arras on the road from Bapaume to Valenciennes; the First Battle Of Cambrai, November 20-December 3, 1917, saw one of the first deployments of tanks by the British Army – see Sir Arthur Conan Doyle’s account at http://www.firstworldwar.com/source/cambrai_conandoyle.htm; the Second Battle Of Cambrai, October 8-10, 1918, was part of the Allies’ conclusive Hundred Days Offensive. (6) Saargemund: now in the Moselle department of Lorraine, France; known as Sarreguemines when French (1766-1871, 1918-present); only a few words between Cambrai, above, and Saaregemund, but a long train journey – 406 kilometres southeast. Next week: Sam, on a train to who-knows-where again, is shocked to encounter an affable Landsturm guard – then shamed by a mob of his fellow POWs fighting over food. 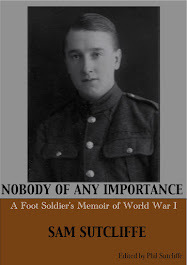 (1) In his 70s, Sam Sutcliffe wrote Nobody Of Any Importance, a Memoirof his life from childhood through Gallipoli, the Somme, Arras 1918 and eight months as a POW to the 1919 Peace parade. A hundred years ago this week… After a hectic period during the previous seven days with the Central Powers aggressive on several Fronts, now the action subsided again, temporarily of course. On the Western Front, while the Americans held the line in the lengthy Battle Of Belleau Wood (June 1-26; near the Marne), German attacks were repulsed by the French and British around Reims from Sillery to Trigny (18) and at Bligny (22), while the British advanced a little southwest of Meteren on the Lys in Nord-Pas-De-Calais department (23). Down in Italy, the Second Battle Of The Piave (June 15-24) saw the Italian Army hit back against the initial Austro-Hungarian onslaught on a very long front from north of Venice to the Asiago Plateau by taking Razea Pizzo and the heights of Sasso Asiago, gaining ground in the Grappa region and turning back the invader’s attempts to cross the Piave between Sant’Andrea and Fossalta (17), then occupying Capo Sile (18; just north of Venice). As the Austro-Hungarian push faltered, the French took mounts Betigo and Pennar on the Plateau, and the Italians mount Costalunga (19). The Austro-Hungarians called off their attack on the 20th and over the next few days the Italians regained all the ground they’d conceded (casualties 87,181 Italian with some British and French, 118,000 Austro-Hungarian). General Foch, Allied Commander-in-Chief in France urged the Italians to press on, but their General Diaz refused because his forces were too thinly spread – proven a good decision as, regardless, the Austro-Hungarian Army (and Empire) soon went into a tailspin of decline exacerbated by food riots back in Vienna. Aside from that, in the interesting aftermath of the Russian defeat and Brest-Litovsk treaty with the Central Powers, the Ottomans continued their advance in northern Persia and beyond – naturally with an eye on annexing some oil, but also with a degree of caution because their German allies were looking in the same direction. Still, they occupied Dilman in Azerbaijan, defeating the Armenian defenders (18). 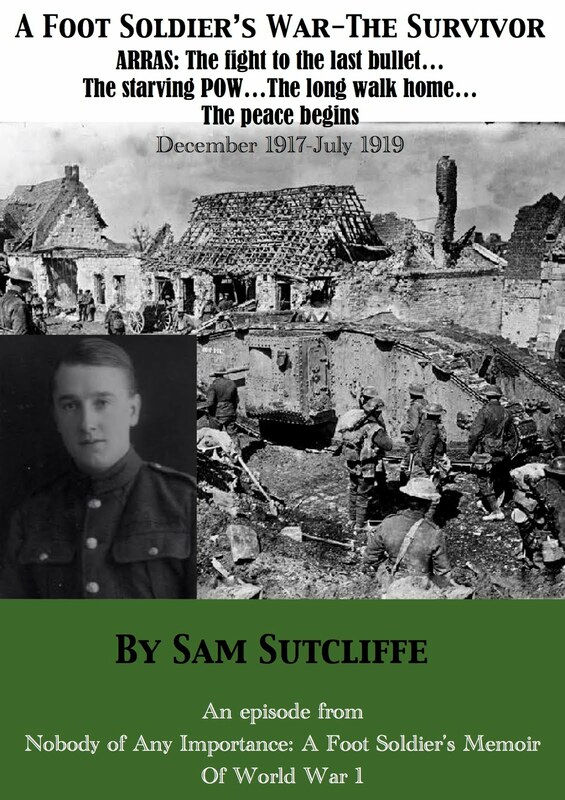 Last week, my father, Sam Sutcliffe, taken prisoner outside Arras at the tail-end of the German Spring Offensive and then part of randomly-assembled bands of POWs – wandering from Denain to Marchiennes to Sancourt, then lately, to Bapaume – had a somewhat encouraging time as he and his comrades helped fellow front-line soldiers, the wounded patients at a German field hospital. Incoming “friendly” shells and bombers suggested they were quite close to advancing Allied forces, which perked them up. Then, a German newspaper brought Sam down to earth again as he read about the enemy’s successes in the battlefield and the peculiarly alarming fact that a long-range gun was bombarding Paris – “it became difficult to maintain faith in eventual victory,” he wrote. ‘Soon, another move. The Germans put some of us on a train and, after a while, we alighted at an unidentifiable spot where we were quartered in a couple of huts. So well remembered, this place – especially because the evening stew had occasional chunks of meat among the stewed root vegetables; tough meat, undoubtedly horseflesh, but ranking as a luxury. And it meant the daybreak ersatz coffee with black bread could all be consumed as one meal now because we knew our bellies would be filled again later – until then most of us had tried to save a thin slice of the morning bread to avoid that horrible empty feeling throughout the night. The first day there provided another surprise, for the guards did not accompany us when we set off to work. Instead, alongside us walked several Germans armed with revolvers, not rifles, and wearing uniforms of a superior cut and caps with shiny black peaks and red-and-gold bands round the crown. Their chief wandered happily here and there around and among us. Presently, we came to an area where massive barbed-wire defences stretched right and left as far as the eye could see. They led us through a wide gap and we marched on, the barbed wire ranged on either side of us. Its great depth amazed me. I’d seen nothing so vast as this before – and the word passed quietly amongst us: “This must be the Hindenburg Line(2)”. The chief amused himself by shooting at the wood stakes securing the wire, or at the occasional can lying around. This kept him happy while demonstrating to us his good marksmanship and, possibly, the reason why the Jerries had dispensed with the usual guards. We worked on railway construction, building a branch line through a wooded area to join a main line nearly a mile distant. We started on low ground, joining together pre-fabricated sections of light, narrow-gauge track and proceeding gradually uphill. With competent instructors, we learned quickly, levelling the ground and packing stones under cross-members. We soon completed the uphill part, then laid more track across the higher level for about a quarter of a mile, excavating earth on each side of it and shovelling the spoil into small metal tip-trucks – about 20 of them. When all the trucks were full, we’d begin pushing them, two men per truck, towards the downhill section. When the leading three trucks reached the start of the slope, each two-man crew mounted the small platform at the rear of their truck and applied the brakes by turning a wheel. When all appeared ready for the descent, the chief gave a signal, brakes were released, and with a push from the men waiting behind, the small train got under way. Speed increased, controlled by light touches on the brakes, and momentum carried the three trucks along a short length of level track at the bottom of the hill. Then we tipped the earth out of the trucks, making a ridge along one side of the track. Next train down tipped on the opposite side. While we were pushing our empty trucks back up the incline and loading at the top, others removed a short section of track, levelled out the ridges of earth we’d dumped, then replaced the track on this new, flat surface. The third train down would stop short of the raised section and start a repeat process. Then I heard an awful noise down below and cries of pain. Several trucks had left the rails. Mine was at the bottom of the embankment, wheels uppermost. My mate had jumped clear as the truck ahead canted over, but several men were hurt and one badly crushed. Next week: Sam and POW comrades continue their labours as railway navvies, doing the full John Henry, manhandling railway sleepers and steel rails – and feeling oddly strengthened and consoled by proper work, with respect from their guards (and the odd bit of horsemeat in the stew). But then they’re on the move again… to Germany, the Saar and impromptu temporary imprisonment in a corner shop! Sam and POW comrades take a train – 4th Class! luxury! – to Bapaume and work at another German field hospital… in line of fire from stray British shells – good news!? Then an Allied air raid gives the starving Tommies a chance to nick some food. A hundred years ago this week… The fourth and last phase of the German Army’s Spring Offensive attempt to overwhelm the Allies on the Western Front hit the buffers. The Operation Gneisenau attacks (June 9-13) saw the Germans advance on Compiègne, take the heights of Marqueglise and the French withdrawing from Carlepont Wood and around the Aronde river (10). But the following day the French Army counterattacked from Rubescourt to St Maur, recaptured Belloy, and caught the Germans by surprise at Compiègne with an infantry-plus-tanks assault not announced by the orthodox preliminary artillery bombardment. At the same time, the Australians advanced at Morlancourt, between the Ancre and the Somme, and the Americans made progress in the Battle Of Belleau Wood. Within a couple of days – some sources say on the 12th, others the 13th – the Germans called off Gneisenau (casualties: 35,000 Allied, 30,000 German). Immediately after that, further north the British Army successfully attacked Bethune along the La Bassée Canal (14) and the French regained Coeuvres (15; southeast of Compiègne). On the Eastern Front and beyond, post-Russian-Revolution-and-surrender turmoil continued: German troops advanced further into Georgia, taking Tiflis, and newly “independent” Ukraine signed an Armistice with the Russian Bolshevik Republic (both 12); in Omsk, a combination of the Czechoslovak Legions (still heading east) and royalist Russian Army officers founded a Provisional Siberian Government – while 2,500 kilometres east, and still well within Siberian borders, White and Red Russians fought for supremacy in Irkutsk (13). This week also saw a sudden escalation in the fighting between Italy and Austria-Hungary where the front line had settled just north of the River Piave and Venice following the previous autumn’s Italian rout at and long retreat from the Battle Of Caporetto. The Austro-Hungarian Armies launched an all-out attack from the mountains east and north of Venice to the Adriatic Coast, the Second Battle Of The Piave (June 15-24). They crossed the river in the Nervesa and Fagare-Musile regions along a 24-kilometre front (15), and gained some ground northwest of Venice at Montello and Capo Sile (16), but then the Italian Army stalled their advance (abetted by British troops on the Asiago Plateau, about 100 kilometres northwest of Venice). 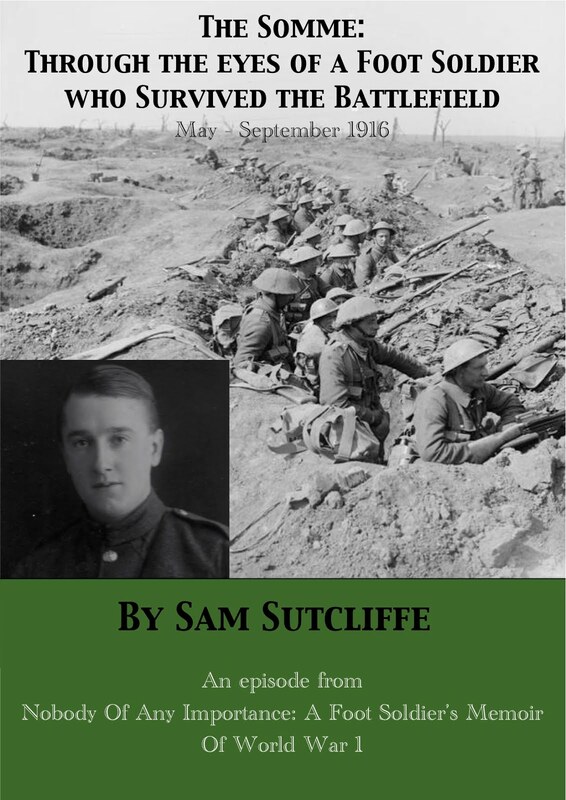 Last week, my father, Sam Sutcliffe, taken prisoner outside Arras at the tail-end of the German Spring Offensive and then part of wandering and randomly-assembled bands of POWs, left his first purpose-built prison camp in a small town called Sancourt about four miles north of Cambrai – after an interesting interlude in a German field hospital recovering from dysentery, helping wounded German soldiers, and faking a food-for-(non-existent)-Tommies’-gold-rings exchange with a dangerous spiv who worked there as an orderly/nurse. ‘We actually travelled in compartments marked “Fourth Class” – “Vierte Klasse” – instead of the usual goods wagons and we arrived after many delays at, of all places, the famous Bapaume(2) now in German hands. On foot, we crossed several railway tracks, passed the ruins of some buildings, then filtered through an area cluttered with wrecked tanks, lorries and guns. Clear of all this junk, I saw a German aeroplane which had crashed; I was surprised at its general scruffy appearance, the rough finish of its fuselage. It looked like a really cheap mass-produced monoplane, so different from the gleaming red bi-planes of Richthofen’s squadron which had spent a sunny afternoon photographing and shooting up our sector shortly before the big German attack(3). This grey-green, Spartan, single-wing plane could probably have been turned out in large numbers at low cost – and, doubtless, with little consideration for the safety of the youngsters who would fly them. Its gauntness reminded me of the remains of the horse lying by the roadside near Gavrelle. Desperate shortage of equipment as well as food seemed indicated. The huge German effort must be the last gamble, I concluded. Bad though my condition was, I felt more cheerful and hopeful of survival until fighting ceased. Another tented field hospital loomed ahead and there we stopped. We were to work there, living in tents. My first job there, with a group of other prisoners, was distributing food. In each large tent, the orderly or male nurse took charge of it, and then gave us our next task – usually taking covered buckets away to the latrines for emptying and cleansing. We cleared any litter from the earthen floor of each tent and dumped it by the ever-burning incinerator a few hundred yards away. Other prisoners had to carry stores from the railway siding – heavy work for such enfeebled men. The wounded German soldiers lay in wooden bunks, many of them, for warmth, still wearing their grey tunics or draping them over their shoulders if they had arm or torso wounds. The German Army, like ours, passed serious cases back to better-equipped hospitals, but returned the lightly-wounded to their units after brief treatment which showed little humane consideration for their needs. Our diet remained the same, wickedly poor and sparse. So when the blessing of a British air raid on the area furnished an opportunity, we got busy. Anti-aircraft guns made a terrific din and set all the hospital staff running in one direction… Then they vanished. When someone yelled out the explanation – “They’ve gone down into dugouts!” – as one man we rushed to their tents and grabbed anything edible. After that, we headed for the hospital tents and gobbled up every bit of food we found. I saw no wounded man objecting, nor did any of them complain later to the staff about our conduct; perhaps they were glad to see us around, their own (male) nurses having left them to their fate. No bombs fell on the hospital, so we awaited the next raid with some eagerness. I recall an occasion when one of these shells burst and I heard a chunk of metal buzzing my way; when it hit the ground I picked it up – it was hot! – and carried it to a group of Germans crouching in a shelter and dropped it among them… to their surprised consternation, until my grin and the word “souvenir” reassured them. On such rare occasions, I felt some self-respect briefly restored. But the German boys helped me to understand the main news items. Thus, I learned that several places, which had been well behind our Army’s front line before the Ludendorff assault, were now established as German Army staff HQs. And a depressing feature with a Berlin dateline claimed that Paris was under bombardment by a huge gun(4), its shells hitting the French capital every half-hour from a position 90 kilometres away. The Germans had bombarded London from the air, initially from the sausage-shaped airships named after Count Zeppelin, later from aircraft, but a gun lobbing big shells into the city at intervals throughout every day and every night seemed far worse to me than the brief visitation of an air raid, during which most people could find safe shelter. There could be no warning of approaching shells. Yet people couldn’t spend night and day in hiding; life must go on. What alarmed me about that article wasn’t just that enemy forces had advanced close enough to Paris to bombard it; it meant that, if they reached the French coast, they would be able to shell England. Again it became difficult to maintain faith in eventual victory for our Forces. Speculating on what our fate would be if our side were defeated caused me a spasm of deep despair. (2) Bapaume: 30 kilometres from Cambrai, 22 kilometres south of Arras; occupied by Germany August 28, 1914; one of the objectives not reached by the British attack during the 1916 Battle Of The Somme; liberated March 17, 1917, by Australian troops; recaptured by Germany during the Spring Offensive, 1918; liberated again by New Zealand soldiers on August 29, 1918, during the Second Battle Of Bapaume, August 2-September 3; after the war, Sheffield “adopted” Bapaume, financing the construction of a dozen houses and, with finance from razor manufacturer George Lawrence, a school. (3) See Blog 188, February 11, 2018. (4)“The Paris Gun”, the largest artillery piece by barrel length (21 metres) used by either side during World War I, fired on Paris, March to August, 1918, from Coucy-Le-Chateau-Auffrique, Picardy, actually a range of 120 kilometres; developed from a Navy gun, so manned by sailors, it lacked accuracy and delivered relatively small shells, but it was seen as a “psychological” weapon; Wikipedia says the shells were the first human-made objects to reach the stratosphere, their trajectory reaching its apogee at 25 miles. A hundred years ago this week… Allied resistance to the third phase of the German Spring (into summer) Offensive continued with the Third battle Of The Aisne/Operation Blücher-Yorck evolving into a series of actions around the Aisne and the Marne, the most substantial being the Battle Of Belleau Wood (June 1-26). Initially, American Marines held the line there, legendarily rejecting French insistence on a tactical retreat – “We only just got here!” etc – before combining with their allies to attack Hill 142 (6) and blow the Wood apart with artillery (9). And yet the German Army still launched a fourth wave of major onslaughts with the Noyon-Montdidier Offensive/Operation Gneisnau between Amiens and the Aisne – on a 23-mile front they immediately advanced nine miles, a formidable initial success, entering Thiescourt Wood and Ressons-sur-Matz (about 60 kilometres southeast of Amiens). Meanwhile, the over-stirred pot of Russian military-political stew got another hefty spooning from all sides as the British landed troops at Pechenga and Kern in the north, German forces entered Georgia via the Black Sea port of Poti, and the “revolting” Czechoslovak Legion spread mayhem ever further east by occupying Omsk, Siberia, in concert with local White Russian officers – by Wikipedia’s account “during the summer Bolshevik power in Siberia was totally wiped out”. Last week, my father, Sam Sutcliffe, taken prisoner outside Arras at the tail-end of the German Spring Offensive and then part of a wandering band of POWs, got some decent food inside him because he was sent to a German field hospital, near his latest prison camp at Sancourt, outside Cambrai, suffering from dysentery and malnutrition. It wasn’t that the staff fed him well, but some of the wounded German soldiers showed their sympathy with a fellow front-liner by giving him whatever food they couldn’t manage. However, as he recovered, a spiv-like and wicked-looking orderly called Adamski approached him to do a deal. For some reason utterly convinced that the British POWs at Sancourt were all a-bling with rings and such, he offered Sam all the food he could carry if he would trade it for the Tommies’ gold and bring the booty back to him when, in due course, they were moved on from Sancourt – which would involve walking past the field hospital. I often stood hopefully near the barbed-wire fencing, knowing that front-line German fighters, men from the trenches, had no hatred for us – often a degree of sympathy, in fact – and would sometimes endeavour to converse with me when they passed by on the road (also they didn’t give a damn for the older Landsturm(2)men who guarded us). One such kindly soldier gave me a German printed field card, similar to the British version I have previously described(3), with a series of printed statements which said “I’m well” or its opposite or “I am in hospital” and so on. I looked at his card, struck out the lines which, according to my rough translations, did not apply, addressed it to my parents in England and handed it back to the kind young German with a “Dankeschön”, but no hopes of it ever being received at home. Probably the only way the card would get into the German postal system was if the soldier handed it to his Regimental Post Office. Sometimes work took me over the Belgian border(4) and I recall the drab scene when, during a rest from work, I strayed from the party of prisoners, sat on a small heap of slag, and compared the view with similar ones I’d seen around coalfields in northern England. An old man dressed in black cloth with black leggings and heavy boots joined me. The customary exchange of words, signs by looks and hands, along with something approaching telepathy, established understanding between us and I learned that he had worked in a mine near Mons(5) “over there” – he pointed, but I couldn’t see any sign of the colliery, it was too far away. ‘One day, the guards told 50 or so of us to get ready to leave Sancourt. I draped my thin blanket over my shoulders, hung my precious Jerry mess can on the string I used as a belt, and stuffed lots of forks and spoons into an old sack which I now carried wrapped around my body under my tunic. The gang set off at a crawl towards the railway station. The danger of Adamski spotting me was obvious – the road passed fairly close to the field hospital, which was sited in a hollow bounded on one side by the railway line. Explaining my difficulty to the men around me, I positioned myself in the middle of the group, asking them to conceal me as much as possible. As we approached the place, I could see the bulky figure of Adamski standing at the foot of the embankment below the road. I feared he would kill me when he discovered I had no gold rings for him, but I hoped I might escape his notice by keeping my head down and getting those around me to keep close. We had almost passed him when he spotted me; the roar he let out must have startled the several guards who accompanied us, for one of them stopped to question him as he awkwardly scrambled up the incline. The word “Ringen” came over loud and clear. We continued marching so I risked a backward look and he pointed towards me, shook his fists and ranted terribly. But still the guard appeared puzzled and stood in Adamski’s way. (2) 3rd-class infantry, comprising any male aged between 17 and 42 who wasn’t in the standing Army, theLandwehr. 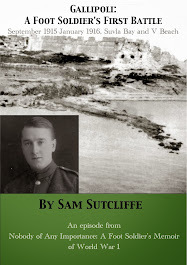 (3) Sam sent a couple home when just about to sail for Gallipoli in 1915. (4) The Belgian border at Quievrain is about 50 kilometres northeast of Sancourt. (5) Mons, Belgium: 74 kilometres north-east of Sancourt; notoriously the scene of the British Expeditionary Force’s first battle of World War I, August 23-4, 1914, the Canadian Corps liberated Mons on November 11, 1918, and, says Wikipedia, one memorial plaque in the town claims “Here was fired the last shot of the great war”. Next week: Sam and comrades take a train ride – 4th Class! – to Bapaume and work at another German field hospital… in line of fire from stray British shells! Sort of good news… then an Allied air raid gives the starving POWs a chance to nick some food!